Hibiscus rosa-sinensis, more commonly known as hibiscus, is a flower that is widely recognised for its health benefits as well as its striking beauty. It thrives in tropical conditions, particularly in Southeast Asia, Western Asia, and in certain areas of Central America and Africa. 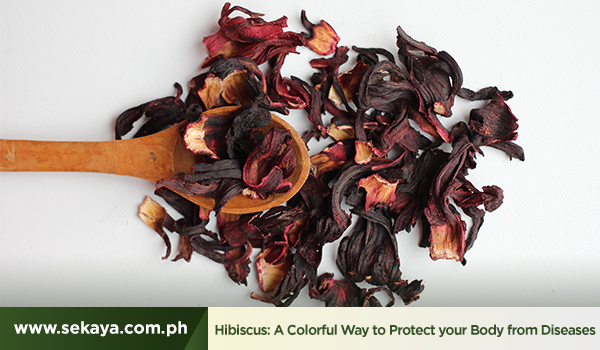 The use of dried hibiscus flowers as both alternative to caffeinated tea and herbal remedy dates back to ancient times. Ancient Egyptians used hibiscus tea as a special form of refreshment for the pharaohs as well as for healing a variety of conditions. In the 19th and 20th centuries, the flower became so popular around the world that societies dedicated to the different varieties of hibiscus were formed, including the American Hibiscus Society, which remains active until today. Apart from being known as a rich source of Vitamin C, hibiscus is also recognised for its capacity to help manage the body’s cholesterol levels, thanks to its bioflavonoid content, which essentially aids in eliminating bad cholesterol and other harmful toxins. In 20131, researchers concluded that the anthocyanin found in hibiscus acts as an effective detoxifying and anti-inflammatory agent that helps reduce blood pressure and prevent plaque build-up in arteries. A 2014 study2 also noted the anti-depressant capabilities of hibiscus through its anthocyanin and quercetin content. Treat your body to a refreshing cocktail of flowers, herbs and citrus extracts that work together to boost your immunity and help protect you from hypertension and other complications related to heart disease. Sekaya Citrus Hibiscus Botanic Infusion is a fragrant botanical blend that features the best natural sources of antioxidants and Vitamin C. Aside from dried hibiscus, it also contains rosehips, lemongrass, lemon peel, and orange peel. For more information about Sekaya’s line of organic botanic infusions that promote overall wellness, click on the following link: https://www.sekaya.com.ph/products.